Atelier CONSTANTIN POPESCU, LLC, started by Constantin Popescu in 1994, is a stringed instruments business with two locations in Connecticut; Westport and Cos Cob. Constantin Popescu, a double bassist, is a graduate of both the Bucharest Conservatory in Romania and of Juilliard School of Music. Constantin has performed with distinction with the New York Philharmonic and many Symphony Orchestras in Connecticut, New York and New Jersey, as well as frequent solo performances in the Europe and the USA. Constantin believes that as a performing musician and teacher, he is more qualified to judge the tone of an instrument than either a dealer or a craftsman. He chooses his instruments by their sound and not by their appearance. 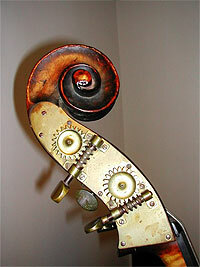 Constantin also restores instruments, a craft that he learned in Europe and which he perfected in the USA. 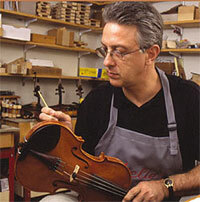 He studied violin restoration with Hans Nebel, as well as bow making and repair with Lynn Armour Hannings. 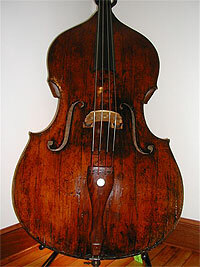 In Italy, Constantin studied in Parma and Cremona where he collaborated with Raffaello Di Biagio where he perfected his violin restoration and instrument making skills. When you walk into the studio and workshop of Atelier Constantin Popescu in Westport, CT, you walk into the world of the luthier, a studio filled with instruments, violins to double basses, some very old, some new, instruments in various stages of repair, all carefully arranged around memorabilia, period prints and lithographs, and antiques. The unmistakable aroma of the woods, of the materials, of varnishes, fills the Victorian house on Westport’s west side. While a student at the Bucharest Music Conservatory, the leading school in his native Romania, Constantin studied the artistry and craft of fine stringed musical instruments. Mr. Popescu’s respect for the instruments is an intrinsic part of his career as a performing musician. The response to this concept - a string player and accomplished artisan restoring and selling stringed instruments, as opposed to the traditional dealer has been overwhelming. Constantin's customers are his colleagues in the orchestras in which he plays, fellow teachers, area students and institutions which include the New York Philharmonic, The Juilliard School of Music, Purchase College, Carnegie Mellon, and the United States Military Academy. His international clientele include musicians in orchestras from Eastern Europe to Vienna, from New York Philharmonic to Cleveland Symphony and famous soloists as Alexander Markov. 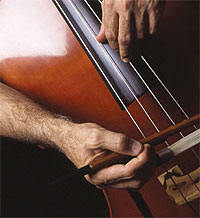 The instruments sold and rented by Constantin Popescu are of the highest quality. Because of our low overhead and the fact that Constantin imports most of his instruments and bows, he is able to sell them at very reasonable prices. Constantin travels to Europe every year to attend musical instrument shows and auctions and spends time with the makers to help develop instruments, which meet American customers’ requirements. In our stores, we offer personal attention to the individual customer who expects only the very best. This is why we prefer to meet with our customers by appointment. Walk-ins are welcome in our Greenwich store. The Riverside School of Music is located next to the Greenwich store. The faculty includes some of the area's top performers and music educators. We also refer teachers in other areas.